Being a godparent is a responsibility that begins at birth and spans a lifetime. Baby christening is your first shot at your new role. At a loss of the perfect gift for your godson or goddaughter? A personalized christening baby gift is the perfect way to make sure you treat baby to a unique gift for their big day. As a godparent, choosing the best personalized baby gifts for your godchild’s christening amidst several options could be daunting. What is more daunting is getting unique baby gifts to buy. As a godparent, you should present the most memorable baby gift out there that will stand out in the crowd. You can never go wrong with gifting your godson or goddaughter a personalized baby shawl. It’s a simply stunning Christening gift designed to keep the baby warm in the winter and cool in the summer, coupled with the all-important details of the day! It can be embroidered with any name you want, particularly his/her baptismal name. What more? Ensure this is nicely wrapped in a cute gift box with ribbon and gift note attached. 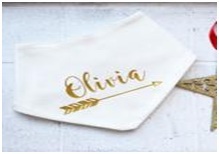 Commemorate the day baby becomes apart of the church with a stylish Personalised Christening Shawl or Baptism Shawl. 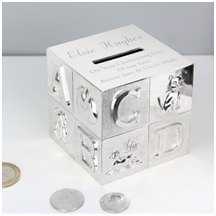 A personalized ABC money box is a gorgeous yet unique gift for a New Born Baby. It’s perfect for christenings and will be a great addition to your godchild’s room. Here is another great personalized gift idea that can even turn into a cherished memento for both baby and parents. Perfect for a baby boy or a baby girl and makes a wonderful baptismal gift. The Bib can be personalized with any message you want for your goddaughter or godson and can be purchased here. Baby breakfast set consisting of a plate, bowl and mug is a stunning gift that will make an ideal birth or christening gift. This is the perfect birth or Christening gift which can be personalized with the details of the baby’s birth including name, weight, and date of birth. Mark in gold the day baby arrived the world with a cute personalized baby birth breakfast set that can be purchased here. 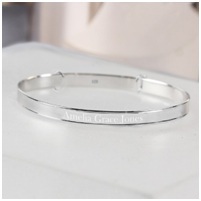 This Christening Bangle makes a perfect gift for a little one celebrating their Christening or baptism. This Sterling Silver Expanding Bracelet can be personalized with any name up to 15 characters and it comes presented in a gift bag.Its expandable feature makes it useful even when the child is older. How sweet is that? This gorgeous baby keepsake can be purchased here. That’s it! You don’t have to spend so much for your gift to be special, but making sure your gift has that personal touch is the magic recipe to creating a baby christening gift that will be forever cherished. Here at DCARO, we believe that going the extra way of having a christening gift personalized can make all the difference. It can turn a lovely baby gift into a lovely memento that will be looked back upon fondly, even when they become an adult and will always remind your godchild of the love you have for them. DCARO is a Personalised Gift Shop and all of our gifts can be personalized, from our traditional christening gifts to our baby room decor or cute personalized bathrobes, so if you want to give your godson or daughter a unique christening gift, please feel free to browse our website.